Learning to Skate? Grab a Mate! Are you a lifelong roller skater with a friend who’s having trouble learning? Or maybe you’re a Lakeland mom looking for a safe way to boost your child’s skating confidence? The solution is waiting at Skate World! Anyone can learn to skate with a Skate Mate. Skate Mates teach confidence and coordination, giving kids of any age the training wheels they need to persevere. Skate Mates are an excellent tool for getting your skating legs under you. Whether you’re learning basic balance or trying a new trick, Skate Mates give skaters a sturdy foundation as they learn to manage their wheels. 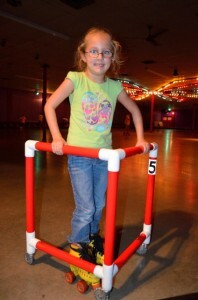 Made of plastic V’s with 3 rotating wheels (think walkers with wheels), these teaching tools eliminate the risk of falling while new skaters learn to move their feet. With the confidence gained from using a Skate Mate, beginner skaters will be zipping around the roller-skating floor in no time! Here at Skate World, we know learning to skate can be intimidating. That’s why we’ve purchased extra Skate Mates to help you learn balance and control. For just $5 an hour you can hone your skating talents with the surety that mistakes won’t land you on your rear. Planning a school function or birthday party? With our private party plan you can give all your inexperienced skaters confidence with unlimited Skate Mate rentals for $75. Take it slow and build your skills with a little help from your friends at Skate World Lakeland. Have you moved beyond Skate Mates, but you’re still shaky on your skates? Do you want to learn to roller-skate the old fashioned way? Skate World has roller-skating lessons every Saturday morning at 11am. Our expert skating instructor gives each pupil personalized advice as the students master their skates. $10 admission includes a 30 minute lesson, skate rentals, and free admission to our afternoon public skating session. There’s no excuse for not learning to skate. Join us today for Lakeland roller-skating made easy!